The best pole saw is an invaluable tool for the homeowner that has tall trees or shrubs. A pole saw is a long handled stick with a saw on the end of it. You can choose between a manual pole saw or a motorized one. These are basically a lightweight long reach chainsaw, they have a small engine that is powered with gasoline, a battery, or by electricity. They are extremely beneficial since they allow someone to stand safely on the ground (instead of precariously balancing on a ladder) and prune tall branches or vines easily. Here are the best pole saw recommendations. 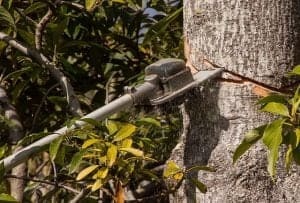 A manual pole saw is great but requires much more physical effort, so to keep it easy this list is only for motorized versions. For more in-depth information on why these are recommended keep reading. Like regular hand saws, there are many different types of pole saws available for purchase. 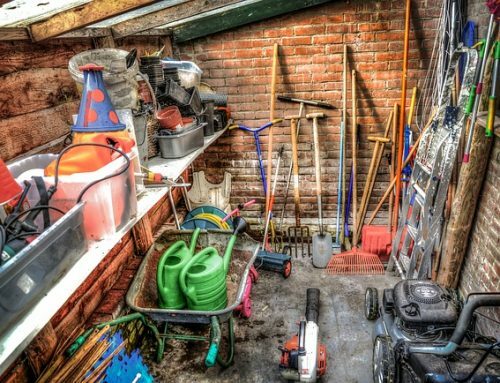 When it comes time to choose one for your landscaping/gardening arsenal there are some things you need to ask yourself first. First and foremost think about the size and scope of work the saw will need to perform. 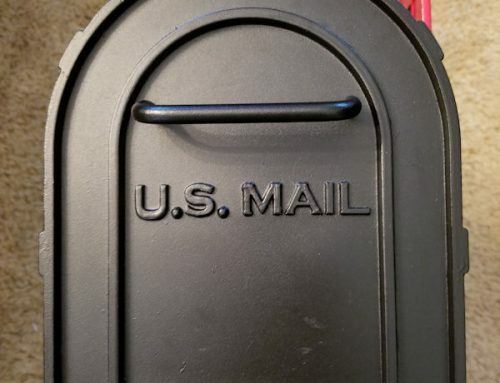 Is this going to be a piece of equipment that is used extensively or just occasionally? What sized branches will you be trimming with it? After thinking about the function, you can begin thinking about some other aspects and what is important to you in terms of specific features. The length of the saw blade (the steel bar in which the chain spins around) will determine the size branches the pole saw can cut. Bar lengths are typically measured in inches and should always be longer than the diameter of the biggest branch it needs to cut. A longer bar length will need greater power to drive the chain. This is ultimately going to determine if the saw is strong enough to cut through the branches you need trimmed. A gas powered engine will have the most power, followed by an electric engine, and then one that is battery powered. You can also use a manual pole saw but then you become the power source:) Each one comes with advantages and disadvantages. Gas powered engines will be heavier, louder, and require more maintenance. Electric are much lighter and have less vibrations but you will either need a generator or constantly be attached to an electrical cord; they are also unusable in wet weather. 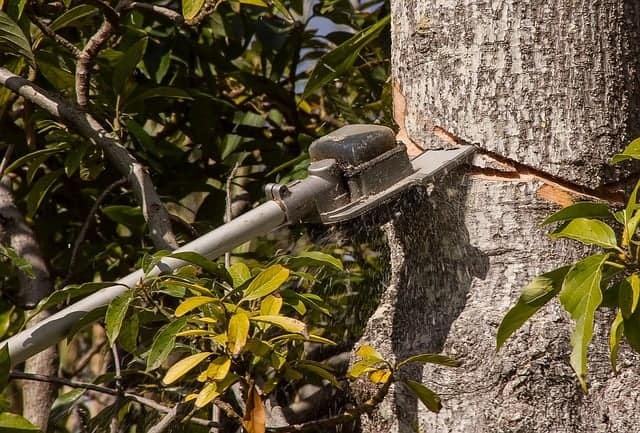 Battery powered pole saws are the most convenient with their rechargeable batteries but they are the least powerful and in turn have the shortest bar lengths. The saw is only as good as the length it can reach. If it doesn’t reach all of the branches it needs to be trimmed it isn’t serving its purpose. So it’s important to take into consideration the height of the trees needing to be pruned and buy the appropriate pole length. If you have multiple tree heights, a telescoping pole may work well as you can adjust the length for different projects. Consider the BLACK+DECKER LPP120 20-Volt Lithium-Ion Cordless Pole Saw if you are looking for a high quality cordless saw. Black & Decker products are always a good, solid choice and this easily makes it onto our best pole saw list. The lithium battery will hold a charge capable of cutting approximately 100 branches 1.5” in diameter, reducing your downtime for charging. The adjustable pole length spans from 6.5 to 10’ allowing you to easily cut branches up to 14’ off the ground; an 8” bar length will handle a maximum diameter of 6”. Weighing in at just over 6 pounds, arm and shoulder fatigue is less than heavier, gas powered models. The Black & Decker LPP120 also disassembles easily for compact storage — a nice feature if you are short on space. Pros: Lightweight and easily portable. Telescoping handle lets you work at varying heights. Breaks down for easy storage. Cons: Saw does not rotate on handle, no automatic oiler for chain. Battery power means you have less power than a gas or AC model limiting the size/thickness of branches it can handle. This model also needs the chain tightened periodically to keep it from loosening too much and slipping off the bar. The Sun Joe SWJ802E 9 FT 6.5 Amp Electric Pole Chain Saw with Adjustable Head which has an adjustable head angle. It can cut branches at 0°, 15° and 30° angles allowing you to easily trim limbs without having to contort yourself into strange positions. When you are working with your arms above your head this is a nice feature to have. A telescoping pole allows you to reach safely up to 15’ in height, and the electric 6.5-amp motor has a built in safety switch to prevent accidental starting. An electric powered motor cuts down the weight of the pole saw considerably; the SWJ802E weighs less than 8 pounds cutting arm fatigue significantly when working. Maintenance is easy too with an auto-oiler that keeps the bar and chair lubricated during use. You can easily cut through branches up to 7.5” in diameter with this saw making it a great option for anyone needing to remove overhanging limbs and cut thin logs. Pros: Adjustable head angle makes trimming limbs and branches less cumbersome. Telescoping extension pole allows for flexibility when working with trees of varying heights. Safety switch on motor prevents accidental starting. Cons: Electric motor means you have to be tethered to an extension cord or generator for power, and you cannot operate this model in wet conditions. The Greenworks 8-Inch 40V Cordless Pole Saw, 2.0 AH Battery Included 20672 offers an instant start/stop, which gives you added peace of mind when working with this power tool. A simple press of a button and the power is cut to the motor immediately, allowing you stop the chain instantly to avoid damage or injury. An automatic oiler applies oil to the chain as needed, which is a great time saving feature. The automatic oiling of the chain and bar means it’s not necessary to periodically stop and do this yourself, cutting into your work time. It also comes equipped with an easy-adjust chain tensioning system that quickly tightens the chain without the use of any special tools. The aluminum, telescoping shaft extends up to 8’. The instant start/stop, automatic oiler, and tool-less chain tightening make this a good option for mechanically un-inclined homeowners with shorter, smaller diameter trees. Pros: Automatic oil keeps chain lubricated, reducing the maintenance you need to perform while cutting limbs/branches. A telescoping pole allows you to adjust the pole length to fit the project you’re working on. Battery power allows you to move easily around the yard without worrying about fuel or an electrical cord. Cons: The motor on the Greenworks saw is battery powered, resulting in a saw that is not as powerful as gas or AC units. Telescoping pole only extends to 8’ limiting reach and can be somewhat wobbly when fully extended. The Remington RM1035P Ranger 10-Inch 8-Amp Electric Chainsaw/Pole Saw Combo makes the best saw list because it provides the features and benefits of an electric chainsaw and pole saw in one. Quickly convert between the two implements without the need of additional tools when using the Remington RM1035P, allowing you to easily trim limbs and then cut the downed branches into manageable sized pieces. A 10” bar cuts through small to medium branches with minimal kickback using the 8-amp electric motor. The electric motor means no stopping in the middle of your project to charge batteries or refill gas, while keeping noise and vibrations to a minimum reducing arm fatigue. The handle and grips are designed to make handling the Remington RM1035P pole saw as easy as possible. This is a great product for someone that needs the power of an electric pole saw and chain saw functionality but doesn’t want to purchase two different implements. Pros: Saw and chainsaw in one allowing you the quick flexibility to cut down branches and then saw them into smaller pieces. The electric motor means minimal noise and vibrations, causes less arm fatigue in the user. No need to worry about having batteries charged or gas on hand. Cons: Requires an electrical source, without a generator you’re limited to the length of extension cords. The WORX WG309 Electric Saw, 10-Inch features an auto-tensioning system and auto-oiler take the guesswork out of using the WORX WG309 Electric Pole Saw while prolonging the life of the bar and chain. The 10” bar length makes quick work of limbs up to 8” in diameter. Bring branches down to the ground and then quickly detach the chain saw to cut them into easy to work with, smaller pieces. Equipped with an 8” stationary extension pole you can easily reach the hard to get to sections in the middle of your tall trees. The powerful motor and unique detachable design make it a great choice for light to medium pruning/trimming work. Pros: Auto oiler and auto tensioning system cut down on maintenance and interruptions during work. A rotating handle allows you to adjust the direction of the saw blade to work comfortably. Cons: Pole is stationary and doesn’t have as long a reach length as some adjustable poles limiting the size trees you can trim while safely standing on the ground. It is also heavy and somewhat cumbersome to use when at its full length due to the weight. The electric motor limits mobility and can not be operated in inclement weather. This is a great gardening/landscaping tool to have in the garage or shed if you have tall bushes or shrubs to prune. Their long handles allow you to stand safely on the ground and trim branches without the aid of a ladder or a professional tree-trimming service. With many different options to choose from, you can easily find the best electric saw that fits your needs. 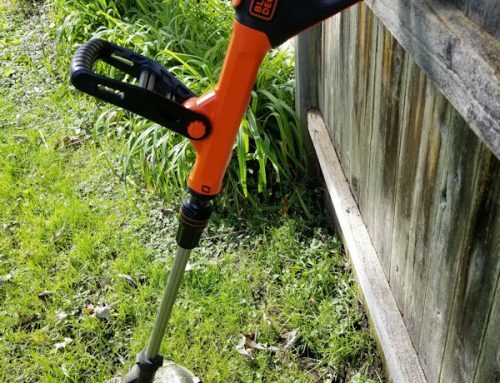 If you need to do some trimming close to ground level check out the best weed eater list.